Are you getting married in Gretna Green and require dance floor hire? Platinum Discos has done Discos in every venue in Gretna Green and has also provided dance floor hire in most of these venues too. Platinum Discos has several white led dance floors which are the perfect colour for a wedding. Some of my favourite venues in Gretna Green are Smiths Hotel, The Gretna Hall Hotel, The Gretna Chase Hotel and Greens Hotel. 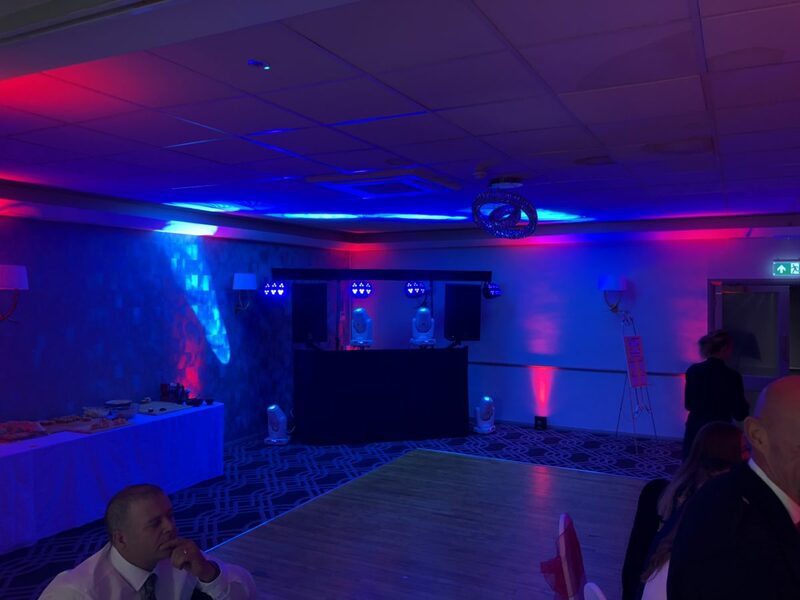 Disco and mood lighting at Gretna Hall Hotel. Platinum Discos dance floor hire guarantees you a beautifully clean and highly polished dance floor that you can see reflections in. This picture taken at Keavil House Hotel near Dunfermline shows you how highly polished our dance floors are. 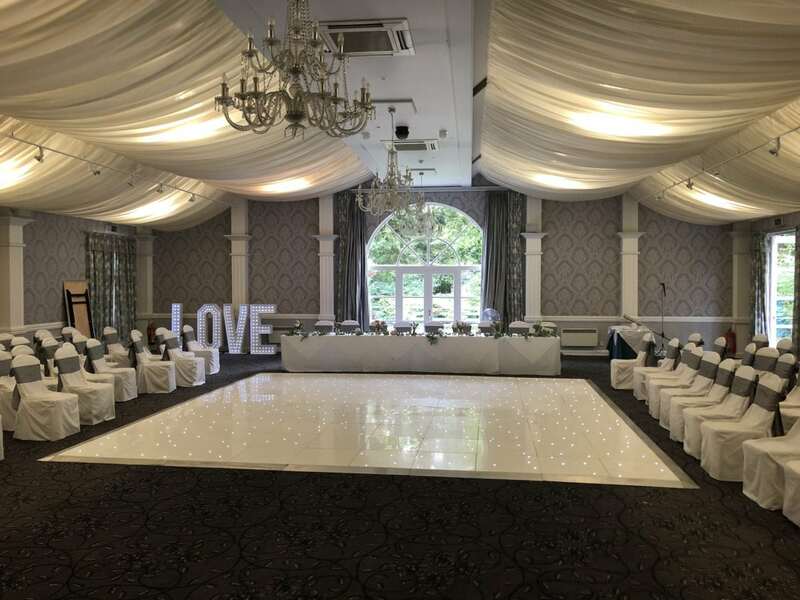 White led dance floor and 4ft love letters at Keavil House Hotel, Crossford. Dance floor hire is very easy to arrange with Platinum Discos. We ask for the date of your wedding, the size of floor you require and the venue name and address plus delivery and collection times. If you’re not sure when the dance floor can be laid we will liaise directly with the hotel to arrange this. We also need your contact details and that’s it. We require a £100 deposit and the balance is due 7 days before the event. 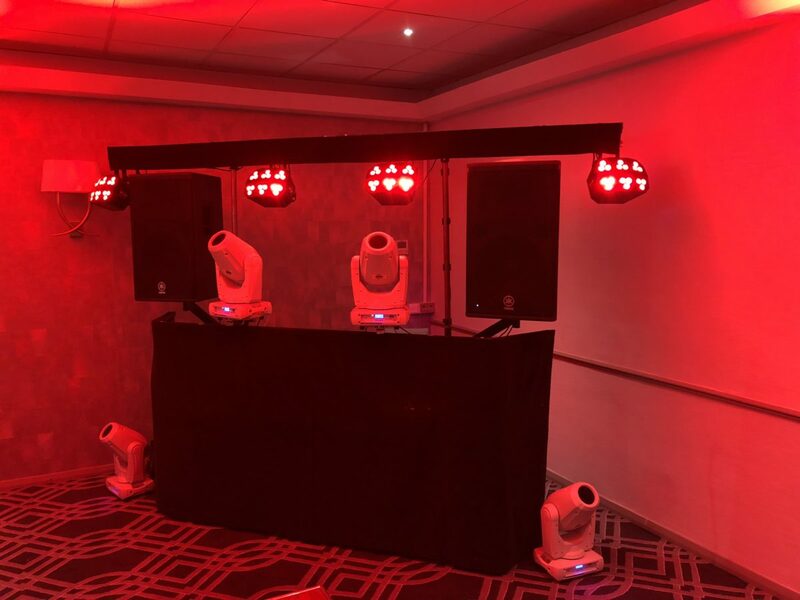 Platinum Discos dance floor hire is top of the range, we use a dance floor purchased from a U.K. company and not a cheap import. Our dance floor is reliable and will stay lit all night. 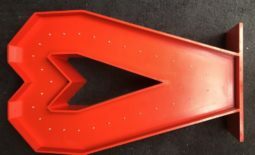 We provide special rubber safety mats to cover the cable that goes to the dance floor and our dance floor hire delivery team can lay your dance floor really quickly. This is particularly useful if your dance floor is being laid during room turnaround where you usually have less than an hour to complete it. 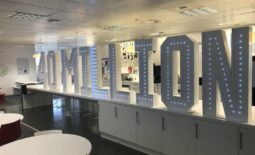 Question: What is room turnaround? Answer: Room turnaround is when the function room is changed from the wedding breakfast set up to the evening set up. This usually involves the removal of the long top table where the bride and groom and wedding party guests sit and additional round tables are set up. 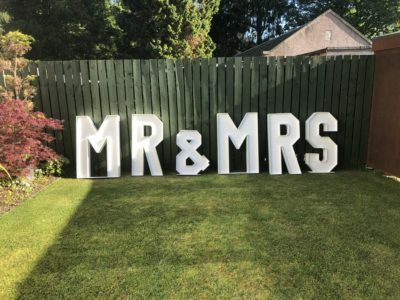 The staff will remove all cutlery and crockery and some or all of the wedding decorations like table centrepieces etc and if they have a carpet over an existing dance floor it will be removed too. At this point your Dj or band will also set up their equipment and a dance floor can be laid. This is a very busy time for the hotel staff and any other suppliers who are providing additional items for your evening reception. Time is very much of the essence and you can greatly help the staff by encouraging your friends and family to leave the function room as quickly as possible so room turnaround can begin. The longer it takes your friends and family to leave the function room the longer it will take to start your evening reception. Question: What size of dance floor can we hire? Answer: We supply almost any size of dance floor. The two most popular sizes are 16ft by 16ft and 20ft by 20ft. We can supply smaller or larger floors and our floors come in multiples of 2ft as the panels are 2ft by 4ft and 2ft by 2ft. In Gretna Green the most popular size of dance floor is without doubt 16ft by 16ft. Most of the function rooms in Gretna Green are for smaller weddings where this size of dance floor is perfect for up to around 80 guests. 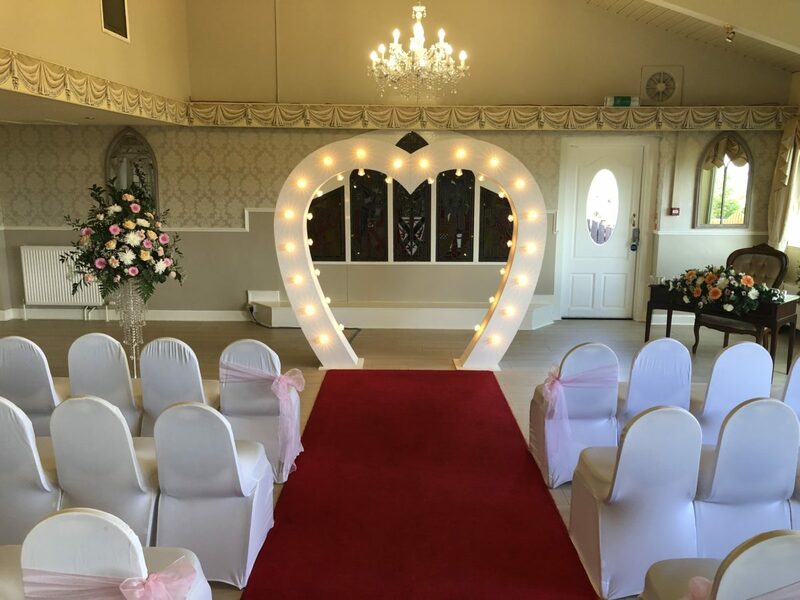 We also supply white backdrops for going behind the top table and items such as wedding post boxes and giant letters and our amazing heart arch for your ceremony. My 7ft tall heart arch. 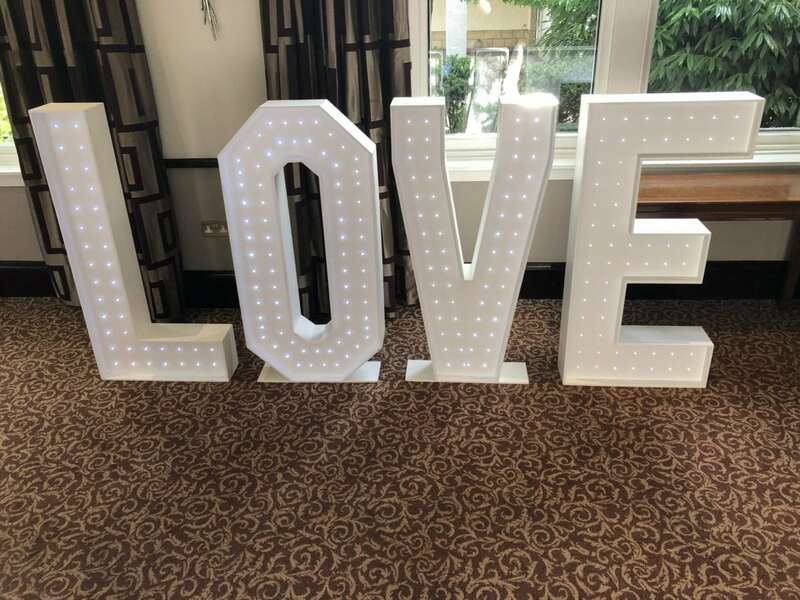 4ft tall giant letter hire saying “LOVE”. 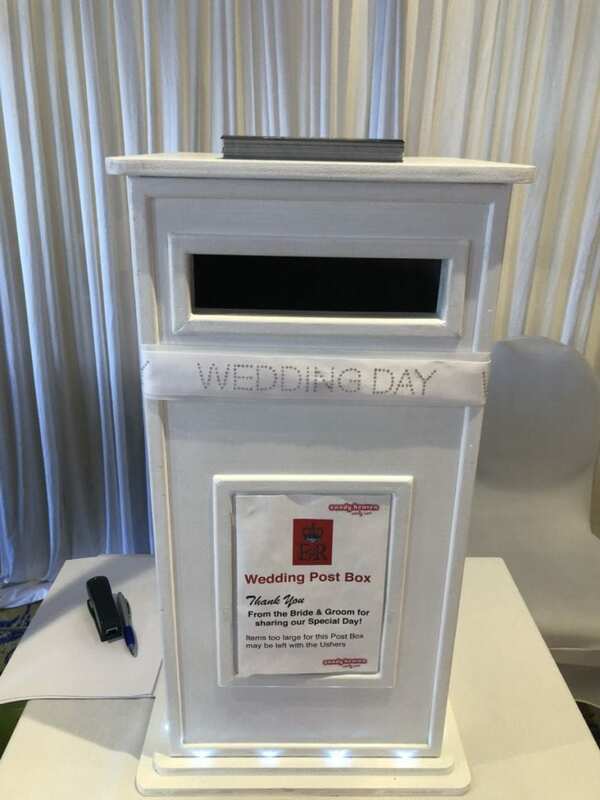 Our smaller table top post box. This can be personalised. My disco at Gretna Hall Hotel Gretna Green. To book Platinum Discos for dance floor hire, wedding Dj hire, photo booth hire etc in Gretna Green please fill in my contact form below.